GRAD 5104 – PFP, 7 years and counting! PFP, 7 years and counting! Something similar to this event was held here at Virginia Tech last spring. It was an attempt to get Hokies talking to one another about topics they disagreed upon but the only one I attended was a poorly planned fumble. Attendees were first asked to identify themselves along a political spectrum- thus effectively “outing” the outliers on the ends for their extreme, in both directions, beliefs. This system was done quickly and without much dialogue- thus disallowing conversation about where others stood and whether or not you belonged on the figurative and literal right or left side of them. Next the line was divided in half at the middle, and the two extreme ends were paired together, the penultimate extremes paired together, and so on all the way down the line so that the most moderate of the attendees were also paired with each other. Once this ill-advised matching was complete, the pairs were given vague questions to discuss that they could either “take deep and personal” or keep light and noncommittal. This whole event was a kerfuffle and, because it was the first in a series, was enough to dissuade me from attending subsequent events. The events listed in the article seem better planned and more engaging of all viewpoints. I also appreciate the small group dynamics rather than the one-on-one environment that we had here. It is near impossible to agree with anyone 100% of the time, thus making a small group a “safer” environment to have a conversation- the more opionins and the more voices, the more opportunities to find common ground, or the variations therein. What is our role as an institution of higher education, but to stretch students’ minds and abilities to present their own opinions. But I do believe there are better and worse ways of going about it. This article fascinates me! While I do belong to GroupMe groups with my students (they also have their own private ones, no faculty allowed!) and they can PM me through the App, I do no text with students who are in my classes. Once I am no longer teaching them, I do text with some students- namely my RAs, my student leadership team, and my Peer Mentors. I always ask if students prefer email or text and only offer it to students that I am in regular communication with. This decision by some Admissions Officers, however, to let students know about upcoming events and admissions decisions, is, in my opinion going a bit too far. These students are not “ours” yet and what checks and balances are in place to protect the privacy/connectivity of these students…especially students that are typically under 18? This semester I took a course in Critical Race Theory in Education. This course, of any that I’ve ever taken, is one that I would not only recommend to any graduate student or current faculty or administrator, but is also one that I would strongly recommend to the graduate school as a required course in the PFP Certificate. It is essentially a survey course that covers CRT as well as other critical theories such as LatCrit, AsianCrit, TribalCrit, DisCrit, QueerCrit, Critical Race Feminism, and Critical Whiteness. This incredibly influential course was a difficult one to process each week but the experience has made me a stronger educator, administrator, student, and citizen. As a current and future educator, it is important for me to understand my Whiteness and the misled “colorblind” society that raised me. As someone working not with K12 students but with university students, it is imperative that we recognize who are students are, how they succeeded in getting to Virginia Tech, and how we are supporting their successful completion of their degrees. I’d be more than happy to speak with any of my classmates about these topics, I have nothing but good things to say about the importance of this course! I recently did a Google search for “Preparing Future Professoriate” to see what would come up, most of the hits were from Virginia Tech, which, I suppose, is because I was using a university computer and Google’s algorithms. One site that came up was from Ohio State University’s Preparing for the Professoriate Retreat hosted by their Office of Diversity and Inclusion. This concept really piqued my interest, especially this week as today, in my Critical Race Theory in Education course, one of my classmates discussed the importance of supporting underrepresented students through extracurricular learning experiences. Her presentation discussed how the pre-college institutes here at VT supported underrepresented and minoritized students’ aspirations for admission into Virginia Tech. I am interested in how graduate students from these populations at Tech are supported in their intentions to work within higher ed and whether or not this sort of retreat or cohort based system, like the Diversity Scholars, may be utilized to increase diverse recruitment and retention efforts. There has been a lot of discussion over the past five years…and even more over the past five months… about Academic Freedom. One of the many ways this conversation impacts me is through my dual role of full-time AP Faculty member and part-time graduate student. Oftentimes I will write an assignment (a paper, a reflection/journal, or a blog post) as part of an assignment, and then second guess myself as to how this may be read by my professors/colleagues differently than it would if I were solely a graduate student. This semester I am taking two courses in addition to my 8a-5p (8a-10p is more like it) job. I am taking Critical Race Theory in Education as well as this course, Preparing Future Professoriate. Both courses have covered topics that I am passionate about and have opinions about and in both classes I have censored myself for fear of my academic musings getting taken as official statements made by a university employee. This is an interesting conundrum that I’ve been wrestling with all semester and I am also interested in getting others’ opinions about it. I feel that when I was a full-time graduate student, I would’ve said something brash about being uninhibited by social/political convention, but now that I’m primarily a full-time employee, my tune has changed. While not about how current faculty are using “disruptive” technologies, I found this infographic to be incredibly interesting in the claims it makes about education in the future. I would love to see a similar infographic providing an overview of the past 30 years as the advent of public computer and internet use really took off during this time. 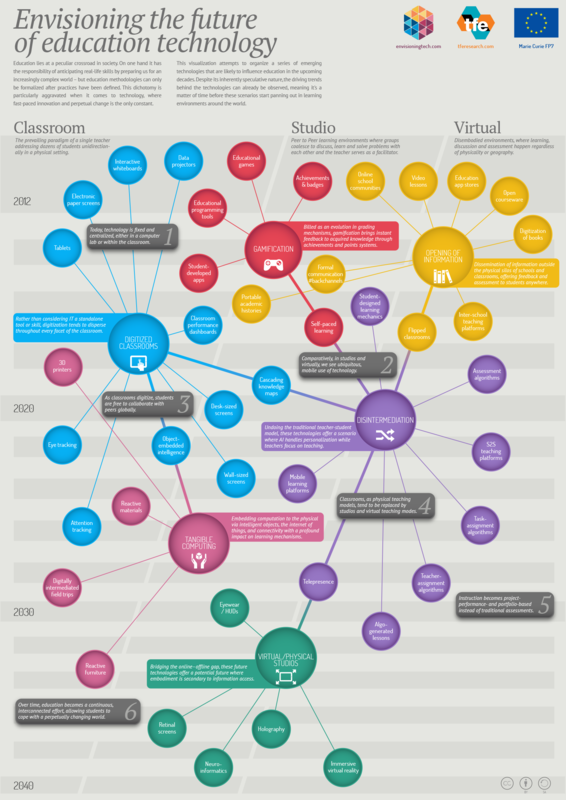 While it would obviously not be speculative as this infographic is, it would be incredibly informative to see a networked timeline of the advances of technologies in education. This infographic, however does discuss the past five years and extends to 2040. The highlights of our recent past include the use of tablets, electronic paper screens, interactive whiteboards, data projectors, educational games, badging systems, student developed apps, online academic communities, open courseware, and portable academic histories, to name just a few. Each of these are technologies I have either used as a student or as a faculty member, though had I been asked before viewing this infographic, I probably could’ve only named 2-3. Over the next five years such technologies as 3D printers, eye tracking systems, cascading knowledge maps, desk- and wall-sized screens, and entire mobile learning platforms are expected to really take off. I can imagine how these technologies will impact education but as they are already so readily available and accessible, I’m unsure that I can fully grasp their impact. Some of the claims about the next few decades are the physical teaching spaces being redefined as “studios” and relying on, rather than incorporating technologies. According to this visualization, before 2040 we should be in the realm of reactive furniture, retinal screens, neuro-informatics, holography, and immersive virtual reality. I understand what these words mean and how they could potentially be used in education, but I am unsure of how great of an impact they will have on the entire learning environment. I’m interested to see what technology that is not on this graphic really innovates our educational system out of left field. Something near and dear to my heart is the connection between universities and their regional communities. I’m not necessarily talking about town-gown relationships-though these are important to creating healthy and vibrant communities both on and off campus. The connection I am most interested in is that of the resources of the university benefitting the region within which it is located. Virginia Tech is a land-grant institution, meaning that the land the university occupies was given in order to advance more “practical” education rather than the liberal arts. At many land grant institutions agricultural research stations were set up under the Cooperative Extension program created to “advance agriculture, the environment, human health and well-being, and communities” (Virginia Cooperative Extension). According to their website, “Virginia Cooperative Extension puts university knowledge into the hands of people. We are credible experts and educators who provide information, education, and tools you can use every day to improve your life” (Virginia Cooperative Extension). This community engagement is something that I believe should advance in higher education. I do not believe it should be the sole responsibility of land grant institutions nor do I believe that university knowledge and resources should remain in the so-called ‘Ivory Tower’ that is academia. Higher education was created as a public good to advance and further educate society. I believe that better connecting education to resolving social problems is one way that we can advance many goals in one concerted effort. I would hope that this would be the truest definition of Ut Prosim. The department I work for is focused on service learning- engaging students and faculty in local and regional community-identified needs. One aspect of this work is bridging the gap between faculty members, their courses/area of expertise, and local community organizations or issues. Sometimes faculty determine that the relationships necessary for this to be successful are too much work and instead assign students an “hours requirement” rather than an intentional and engaged learning experience that advances responses to needs. This is something my department helps to address and facilitate. It is a constant uphill battle, however, as faculty wishing to designate their course as a “service learning course” simply have to check a box on a form with the registrar. There are no checks and balances to determine if the community engagement is truly service learning or if it is simply a volunteer hours counting opportunity for the students. This is something that I would love to change at Virginia Tech. There is an entire academic field of service learning with its own intentional theory and practice and there are many overlapping and interdisciplinary fields that create a Venn Diagram with service learning. It is unconscionable, in my opinion, for any institution put its stamp of approval on service learning designated courses without there being a rigorous process for said designation. This is something that I believe should change here at Virginia Tech as well as within higher education as a whole. The Michigan Journal of Community Service Learning is one of my go-to journals within the field of service learning specifically because of the journal’s commitment to open access. The journal’s purpose is the dissemination of scholarly work related to bridging the gap between campus and community knowledge. “MJCSL is an open-access journal focusing on research, theory, pedagogy, and other matters related to academic service-learning, campus-community partnerships, and engaged/public scholarship in higher education” (MJCSL Homepage, 2017). The intentions of the field of service learning are to bridge the gap between the academy and the community by engaging students in direct application of learning goals and outcomes through community-engaged learning. It is therefore unsurprising that one of the most well recognized journals in the field has made a commitment to open access. I am pleased by the intentionality by which the Editor makes this open access pledge as well as its placement on the journal’s website. A Welcome from the Editor (copied below) greets visitors on the homepage as an invitation to join the work of community-engaged scholarship through this reconsideration of their practice regarding the dissemination of research. Thank you for your interest in the Michigan Journal. Launched in 1994, the Michigan Journal of Community Service Learning (MJCSL) is an international, peer-reviewed, multi-disciplinary academic journal for college and university faculty and administrators, with an editorial board and cadre of peer reviewers representing faculty from many higher education disciplines and professional fields. It is a publication of the University of Michigan’s Ginsberg Center. We seek articles at the cutting edge of research, theory, pedagogy, and other matters related to academic service-learning, campus-community partnerships, and engaged, public scholarship in higher education that extend the knowledge base and support and strengthen researchers’ and practitioners’ work. We also publish review essays of newly-released books pertinent to service-learning and community engagement. Please review our Submissions page to learn more about our submission and review process. Beginning with this issue (Volume 23 Number 1), each issue of the MJCSL will be published using an open access digital format. We will no longer have a one-year embargo period. Each issue will be accessible upon its release (in November for the fall issue, in April for the spring issue). We are also unveiling this new website. Hosted by the University of Michigan’s MPublishing, with this website you can electronically access past issues and articles of the MJCSL, searching by author, title, or journal volume and number. You can read the articles online or print copies. We believe that this format better serves our goal to disseminate leading service-learning and community engagement scholarship as widely as possible, and is more consistent with our values of access equality and environmental stewardship. We no longer make print subscriptions available. However, print-on-demand copies will be available through a partner for those who desire a hard copy. Information will be posted here when the arrangement is finalized. If you have any questions, comments, or suggestions, please do not hesitate to contact me. I find the conversation of ethics in research incredibly interesting. My American educational context is such that I have been taught from a very young age what is and is not acceptable with regard to research methodology. While I’ve had these principles drilled into me and have taken them for process and the way things are, there are many people who have been raised, trained, and brought up in a variety of systems that do not correlate. While living and working abroad in 2009 I made friends with several local university students. I befriended in one student in particular who had a very different view on ethics with regard to academics than I had ever experienced. He relayed story after story about how academic success was a community effort in his country, and all means necessary were employed to advance individuals through schooling. This included was not limited to test banks, unauthorized cohort-based work, and other forms of ‘illegal’ help. We had many conversations about the ethics around this and he said that it was 100% acceptable because everyone does it and everyone is competing to get ahead but regardless of who gets ahead and who doesn’t- his community still advances. This was a fascinating concept to me, especially after confirming his story with other local friends and they didn’t bat an eye. While they were unsurprised about his methods, they did frown on them somewhat and did discuss how it tarnished their own honest work-especially in the international sphere. It was unclear if they were saying this to me as an American or held this view regardless. Upon returning to the US for graduate school, I paid particularly close attention to the messaging regarding what was and was not legal here at Virginia Tech. I was impressed at the lengths taken to explain VT’s Honor Code and the systems in place to uphold it. I spent time discussing this with friends and colleagues- both American and international- and found that my experience abroad was not uncommon and that definitions of ethics varied between many cultural contexts. The fact that the Office of Research Integrity website existed shouldn’t have been news to me. Despite this fact, it was fascinating to see such a public forum for announcing researchers’ ethical transgressions. At first I was affronted by the concept but I quickly warmed to it as a consequence of ethical misconduct. I read many of the cases and many did not make much sense to me with regard to their subject matter, but what was clear across each was the falsification of data. In one such study, “the fabricated data, falsified methodology, and false claims based on fabricated and falsified data were reported in two NIEHS, NIH, grant applications, two publications, a poster,” and several manuscript submissions. This case stated that the researcher, Mona Thiruchelvam “provided to the institution corrupted data files as the data for stereological cell counts of nigrostriatal neurons in brains of several mice and rats by copying a single data file from a previous experiment and renaming the copies to fit the description of 13 new experiments composed of 293 data files when stereological data collection was never performed for the questioned research” (https://ori.hhs.gov/content/case-summary-thiruchelvam-mona). This is fascinating to me- both that people believe that these actions are acceptable, but more so I cannot fathom how these falsifications are found out in the first place. I am interested to know the process and the evidence presented to support the falsification accusation. While I would never take such egregiously unethical actions to complete my work, other actions are much easier to imagine doing. Recently I was speaking with a friend who helps adjudicate honor code violations here on campus. She and I discussed the ethical implications of submitting journal entries and blog posts such as these for more than one course, when each has similar requirements. I had not considered submitting the same posts, but had considered writing about the same topics as I often read interested articles in each course and enjoy researching and writing about these topics from each course’s view points. She determined that similar submissions would be fine as long as they weren’t identical and each responded to the specific course’s assignment. It was an interesting conversation, nonetheless, as I can see how students, particularly international students, may question the finer points of these distinctions. Whenever I present about my professional department, VT Engage, I spend 10 minutes on a slide dedicated to our mission statement. I do an in-depth analysis of our mission for two reasons. The first is that I explain the “why” behind an organization developing a mission statement. I want to impress upon students the importance of being able to succinctly and intentionally describe the work that we find so important. The second reason that I spend so long on the slide containing our mission statement is that I go through the statement word-by-word or phrase-by-phrase with the students. This is to both frame the rest of my presentation about our work, but also to engage students in critical thinking about the intentionality behind our words, phrases, and descriptions we use to define ourselves and our work. For this blog post comparing and contrasting mission statements, I chose to examine my two Land Grant alma maters: Clemson University and Virginia Tech. The Clemson University Mission can be read here, and Virginia Tech’s can be read here. The two universities are located within 300 miles of each other in relatively similar environments. Both are nestled within Appalachia though both are also distinctly separate from this culture as well. Both are medium sized research institutions with a strong engineering program and an equally strong focus on football culture. I often remark upon how similar both institutions are and this is true of their missions as Land Grants as well. Both mention some form of engagement, service, application of knowledge, and growth and development. Being passionate about the field of service learning, of course these words and intentions immediately stood out to me. An aspect of Clemson’s Mission Statement that resonated with me was the following sentence: “The University also is committed to the personal growth of the individual and promotes an environment of good decision making, healthy and ethical lifestyles, and tolerance and respect for others.” This to me seemed oddly pointed and I’m quite curious as to the rationale behind including it. An aspect of Virginia Tech’s Mission Statement that stood out to me was the tripartite focus on “teaching and learning, research and discovery, and outreach and engagement.” From personal experience at the institution, the primary focus of “teaching and learning” in reality does not blend with the last focus of “outreach and engagement”. I am obviously biased in my strong belief in critical service learning, but it seems to me that the university supports these three statements separately and not necessarily in unison. It is my hope that the university would place more emphasis on service learning and critical engagement with Ut Prosim. I have appreciated this exercise in reexamining my alma maters, especially now that I have been removed from the primary identity of “student” at each of them for some time. It has been interesting to consider how I have seen the universities live out these missions in various respects but how they may also tout them for their own image or gain.